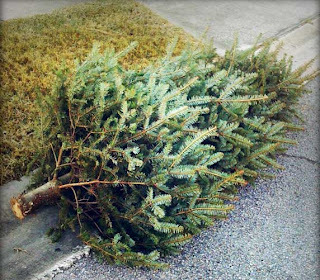 Perry Block - Nouveau Old, Formerly Cute: Oh Christmas Tree, Dead Christmas Tree! I've just never known what to make of those people who leave Christmas lights up and blazing outside their homes until deep into January. Are they still feeling joyous on January 27th or simply slothfully procrastinating the inevitable? Frankly I know little of the ethos of the outdoor Christmas light. When my children were young, we did celebrate secular Christmas (i.e. jolly bearded old fat guy, si; serious bearded young skinny guy, non! ), but I had a strict rule about lights outside the house. HERE LIVES THE WORST JEW IN THE WHOLE WIDE WORLD!!! "What happened, Christmas Tree? Oh, God, you're hurt bad." "Yes, it was so sudden, unexpected ....."
"What are you, crazy? I'm made of wood, idiot!" "Oh, that's right! And I don't have any cigarettes, anyway." Oh Christmas Tree, Oh Christmas Tree ... "
"The next minute, it was 'Herby, get that disgusting mangy thing the hell out of here, it's dropping needles all over the goddamn carpet!'" "Christmas Tree, can I write to anybody for you? Notify anyone? Give a special locket to someone?" "You can get your foot off my stem." "You know, Christmas Tree, the Jewish people respect your kind. We even have a special holiday for trees called Tu Bishvat." "Does that mean that if the Jewish people had a tree like me they wouldn't toss me out like I was so much rubbish or even less than rubbish, like the original cast album of Mamma Mia?" "No, we'd still do it. We'd just feel guilty about it." It was then that I decided to knock on the door of one of the several homes in my neighborhood that still had outdoor Christmas lights all aglow like a tiny tot's eyes and find out what was truly going on with the residents within. Would a fashionably dressed man and woman in their mid-thirties answer the door and graciously bid me enter? Would they offer me champagne, wish me a belated Joyeux Noel, and usher me into their den where a glorious and fully lit and decorated Christmas Tree yet held sway, captivating and illuminating the minds and hearts of all who would enter? The door opened. A short bald fat guy in a T-shirt stood in front of me. From off in the distance, I heard a woman's voice shouting "Herby, I told you to get that disgusting mangy thing the hell out of here, it's dropping needles all over the goddamn carpet!'" At long last, I had my answer. I find if I fail to buy a Christmas tree, then I also avoid the dispiriting needles stuck in the carpet and all down the stairs, the fitting decorations back in the box, plus having to ring the council to discover their policy on collecting old Christmas trees. Also, you can spend the money saved on several bottles of Sauvignon. Sounds like you have your values in proper order! I'm always going to take it down, but after while. I walk past it; it is behind me and forgotten. I've left it up long enough to change the theme -- Valentines is next. Easter is cute. I like to leave ours up at least until the twelve days of Christmas are over. But I've been known to leave it and all the decorations up until the middle or even end of January just because they make the house look festive. Until recently, we had a good-looking artificial tree, so needles weren't a problem. A good-looking tree? I feel like I might want to date a good looking tree! Actually I like it when people leave the lights up for just the reason you mention. It makes things look festive. Of course not that I'd be caught dead looking festive outside my house!